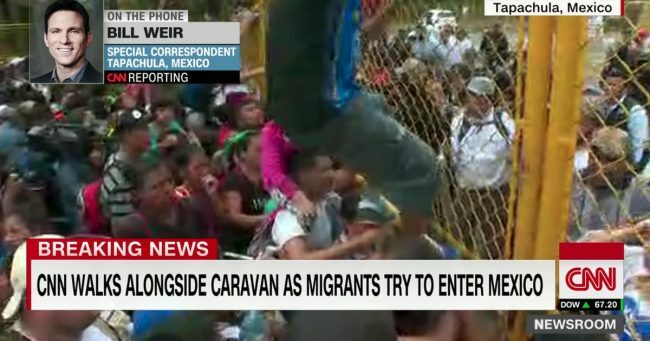 Thousands of Hondurans who have grouped together – are walking toward us, toward the USA-Mexico border. They can be met and their pleadings sorted out while they are re-hydrated with barrels of fresh water instead interrogated at the barrels of firearms – the latter speaking of crassness instead of compassion to the thousands of tragedies those walking here are carrying as deep burdens. We have the resources to meet and care for and sort out the pleadings. Let no one try to persuade otherwise. The last thing a wise person with powerful say-so ought do is try to intimidate or escalate a situation with people who are hungry, exhausted and desperate to protect others and themselves. Trump has a choice to come in peace, hold lines in peace, go forward in peace. – and instead national and foreign interests squatted down hard on the vast natural resources of central america and island nations — whilst giving no fair share to the people upon whose backs they made their fabulous advantages and fortunes. There is that USA allyship with corruptions in central america — that reality also that strongly contributes to the people of central america leaving their war-ruined countries to try for a better life. The persons at top of usa-central american policy throughout the last half of 20th century have huge culpability in today’s mass migrations of pobrecitos, souls toward our frontier. Ive heard all the arguments against those the usa helped to devastate over the past 100 years. Trump has a chance not to exploit by selling people to a new for-profit detention system/ prison system, funded by taxpayer money from the feds. And trump has a chance to be a beacon of humanity now and not an antique pistol with loose hand grips. We shall see what humanity and evenhandedness this President has truly.